We’d love your help. 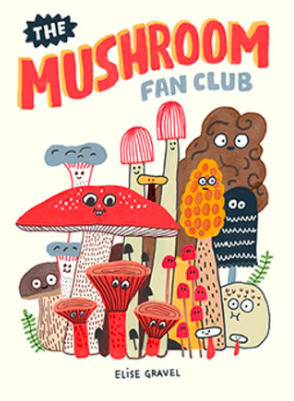 Let us know what’s wrong with this preview of The Mushroom Fan Club by Elise Gravel. Join Elise Gravel as she explores the science of some of nature’s weirdest and wildest characters—mushrooms! Elise Gravel is back with a whimsical look at one of her family’s most beloved pastimes: mushroom hunting! Combining her love of exploring nature with her talent for anthropomorphizing everything, she takes us on a magical tour of the forest floor and examines a hand Join Elise Gravel as she explores the science of some of nature’s weirdest and wildest characters—mushrooms! Elise Gravel is back with a whimsical look at one of her family’s most beloved pastimes: mushroom hunting! Combining her love of exploring nature with her talent for anthropomorphizing everything, she takes us on a magical tour of the forest floor and examines a handful of her favorite alien specimens up close. While the beautiful coral mushroom looks like it belongs under the sea, the peculiar Lactarius indigo may be better suited for outer space. From the fun-to-stomp puffballs to the prince of the stinkers—the stinkhorn mushroom—and the musically inclined chanterelles, Gravel shares her knowledge of this fascinating kingdom by bringing each species to life in full felt-tip-marker glory. To ask other readers questions about The Mushroom Fan Club, please sign up. I love this so much! I would have read another hundred pages in this style about mushrooms. Gravel's information is presented in an interesting and accessible manner. The illustrations are adorable and I just wanted more. I can see giving this to my clever scientist children and even I think the graphic novel kids would eat it up, especially the kids who love Hilda. This book is a fungophile's dream. I have it on display for some reason like I own a bookstore. I think it's a fine line between promoting a love of a bunch of really cool organisms and the genuine danger that some fungi present. This book is fun, but not spectacular. If you like Elise Gravel you'll like this, and if you're unfamiliar you might come away a fan of her art because it's far stronger than her writing. The Mushroom Fan Club is on the 2019 Children’s Choice Award finalist list for grades 3-4. I purchased the book so that my students could participate in the award process this year. It is an informative book with delightful illustrations but it is not a book I would have purchased had it not been for this award. Elise Gravel takes the topic of mushrooms and presents them in a way that this age-group can easily understand. While her illustrations are cartoon-like, they contain enough detail that The Mushroom Fan Club is on the 2019 Children’s Choice Award finalist list for grades 3-4. I purchased the book so that my students could participate in the award process this year. It is an informative book with delightful illustrations but it is not a book I would have purchased had it not been for this award. Elise Gravel takes the topic of mushrooms and presents them in a way that this age-group can easily understand. While her illustrations are cartoon-like, they contain enough detail that they should help a reader discern between mushroom types. Elise Gravel closes the book with some interesting mushroom facts as well as instructions for creating spore prints. Ok, Elise Gravel! You did such an amazing job with this book, now I want to be a part of the Mushroom Fan Club! The perfect primer to the world of mushrooms! Illustrations are reminiscent of Laurie Keller's work, which is a wonderful compliment! A must-have for any child who is interested in finding out just a little bit more about mushrooms than just the ones that are on their pizzas at night. My 4 year old daughter is crazy about this book--she's asked me to read it every night (sometimes multiple times) for days. There is a lot of interesting information in this book and the illustrations add plenty of quirkiness and charm. My daughter's favorite part is the section that highlights some really unique mushrooms including one that smells like dog poo---what preschooler wouldn't love that? Very cute book; excellent illustration of conveying a passion for something while being informative. I was hoping there would be a mention of toadstools, but maybe they don't use that term in Canada. This is even a format that students could use to write their own "book" about some feature of nature with different species. Honestly, there are few things I enjoy more than extreme deep dives into intensely quirky passions, and that’s exactly what The Mushroom Fan Club is. It would be fun to count exactly how many times you blurt out, “Wow! I had no idea!” as you read The Mushroom Fan Club, or any other one-of-a-kind signature Elise Gravel book, for the first time. A lighthearted study of mushrooms with fun and basic facts and illustrations of many varieties that are drawn with eyes. I learned a thing or two! Includes an activity 'How to do a spore print." A great guide for families who want to go mushroom hunting, like the author. For nature and mushroom enthusiasts of all ages. This is my new favorite book... Love the illustrations and funny, conversational tone. I’m going mushroom exploring with my daughter ASAP. Hope we come across a puffball, morel, dog stinkhorn (at a distance) or one of the others mentioned. Will they have cute little 👀 eyes? We’ll see! Super charming and I adore the illustrations -- and Elise Gravel's voice! Excited to have gotten this for my school library; it's aimed at a younger audience than my students, but we've got a fairly active morel hunting community and I hope this catches their eye. It definitely caught mine! This book is fantastic. Easy to read aloud, fun, and filled with great facts. My kids have requested it every night for the last two weeks. They now know more about mushrooms than I do! I'm seeking out all of Elise Gravel's books to read to them. The personal narrative makes this jump out a little more than your average reference book. The illustrations are fun but also scientifically accurate. There's a fun activity in the back you can try at home and plenty of mushrooms to dig into. Such a great kids book - especially for kids who like to traipse around outside and bring home treasures to identify. The artwork is awesome and the info is just enough to get kids interested, and wanting more, with a touch of quirky. The Mushroom Fan Club is a must for any kids or adults interested in exploring the great outdoors and seeing what they can find. Elise Gravel's love of mushroom hunting and exploring nature comes through in this fun and informative introduction to mycology. Comme toujours les dessins d'Élise Gravel sont superbes!! Côté contenu, j'adore!! C'est une belle introduction aux divers champignons. Même à 28 ans le livre m'a captivé et me donne très envie d'en apprendre plus sur le sujet!!!!! Love the illustrations! The page with all the coolest mushroom names (that sound like ingredients for a witch's spell) was one of my favorite moments of the book. A fun introduction to the world of mushrooms and also a charming invitation to take a closer look at nature when exploring the outdoors! My youngest loves Elise Gravel's Disgusting Critters series, and he really enjoyed The Mushroom Fan Club. After reading it with his dad, he told me all about mushrooms, opening the book to the relevant pages to show me illustrations. Now he can't wait for spring so we can go mushroom-hunting! An adorably illustrated introduction to mushrooms! I liked how the author encouraged kids to try their own mushroom finding trips (being careful to mention mushrooms you shouldn't touch). Definitely recommended to outdoors enthusiasts and also graphic novel fans! I loved how fun this book was! I think this would make a great topic in my Preschool STEAM program! Retro art in earth-tones. Each page features a different type of mushroom. I am definitely a member of the mushroom fan club, so I found this book delightful, informative, and graphically appealing. Yum. I'm almost embarrassed at how cute I think this is. I LOVED this. So quirky and informative!